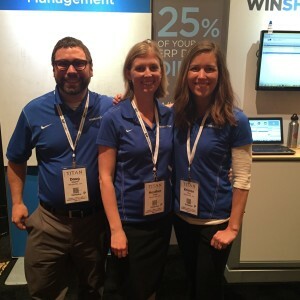 Last week, alongside fellow Winshuttle team-members Heather Oebel and Kristen Mery, I represented Winshuttle at the SAP Insider SCM Logistics Conference at the Mirage Hotel in Las Vegas, NV. It was a very exciting week spent speaking to conference attendees about Lean Data Management, and how Winshuttle can apply a Lean Application Platform solution to address the challenges involved with data collection, data validation and data movement. I first attended the SCM Logistics conference in 2008, when I was working as a Master Data Analyst for Hu-Friedy Manufacturing in my hometown of Chicago, IL. Having worked with SAP for about a year at that point, I was excited to attend my first big conference to expand my knowledge on areas like best practices, new methodologies, and master data management. 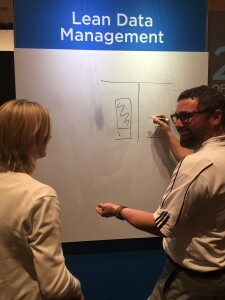 The conference was also held at the Mirage Conference Center that year, and during a break, I wandered over to the exhibition hall to see what new and exciting things were being done within the vast SAP ecosystem. I remember stopping at a booth adorned with translucent blue cartoon keyboard brushes (who, of course, I now know as Brushy) and becoming transfixed on a video monitor displaying how an end user could record, map and run a data automation script for transaction code MM01 (Material Master Create). At that time, I had recently inherited the responsibility of managing a process where material master data was collected on paper forms – some of which were actually faxed to our office from other plants. Once the paper forms were collected, it was my responsibility to hand-key the data into SAP after mitigating all of the errors in the forms. My main goal for attending the conference was to find a way to improve the business-critical master data creation process, and after seeing a short demo of Winshuttle TRANSACTION, I was fully convinced I had found the solution. I returned home from the conference a different analyst. I had learned all about master data management, active and passive data governance, and most importantly, I learned our company was not alone in our endeavor to address our issues with master data. Long story short, we swiftly procured and implemented Winshuttle, which vastly improved our data integrity and minimized our data entry tasks. We were getting out products to our customers on-time, and the organization saw the implementation of Winshuttle supported by our new understanding of master data management as an overwhelmingly positive accomplishment. Needless to say, this accomplishment led me on a totally new career path, and 7 years later, I found myself standing in the same room I had discovered Winshuttle 7 years prior; only this time, I was the person representing Winshuttle. 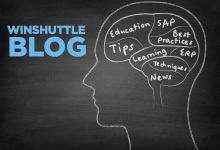 A lot has changed in my career over the course of those years, and a lot has changed with Winshuttle as well. Several of the individuals that stopped by the Winshuttle booth this year were existing customers, many of whom proudly declared they had Brushy displayed on top of their monitor back at the office, and they had experienced a lot of value using Winshuttle to move data from Excel to SAP. It was clear that many people at the conference, (customer or not) were very aware of Winshuttle’s tremendous capabilities around moving data between SAP and Excel and many had known since that conference I attended back in 2008! This year when I introduced the attendees to the capabilities with forms and workflow built with Winshuttle, I could see their reaction was very similar to that first time I saw Winshuttle move data from Excel to SAP; the proverbial lightbulbs were turning on! Many attendees were very interested to learn that not only could Winshuttle provide data automation in terms of data movement, but we could also provide an avenue to field-level data validation to connect business specific rules to SAP, and data could be collected efficiently through a customized workflow. 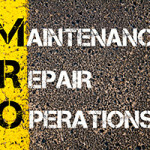 This is an exciting time to be at Winshuttle, because we have the opportunity to not only work with new customers seeking a lean application platform, but also with existing customers who can realize the same success within data validation and data collection that they have seen with data movement. Based on the feedback at the SCM Logistics show, our existing customers were extremely excited to learn how much Winshuttle has grown in the past 7 years and what we are planning for the future. I hope to be working with some of those enthusiastic attendees to help engineer a more robust Winshuttle lean application platform in the near future!